Virtuoso oboist Myfanwy Price took her Friends of Music concert audience by storm at the Durban Jewish Centre last night, February 6. 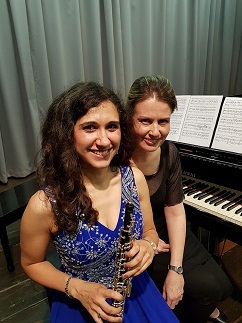 Accompanied by Liesl-Maret Jacobs, the young British musician was making her solo debut appearance in the city since her appointment to the KZN Philharmonic’s principal oboe desk last year. It was heartening to see a number of her colleagues in the audience in support of the event. The evening opened on a light-hearted note with a performance of the Morceau de Salon by the Czech composer, Johann Kalliwoda (1801 – 1866). The piece proved a delicious early example of the palm court salon music genre that prevailed later in the 19th and early 20th centuries. Price and Jacobs dispatched its lilting strains with infectious élan. Their performance of Ravel’s Le Tombeau de Couperin offered a surprise. Originally conceived as a neo baroque suite of six pieces for solo piano, subsequently scored for orchestra, Ravel wrote the work between 1914 and 1917 in memory of friends who had died during the Great War. Here it was given in an arrangement for oboe and piano by Christian Schmitt and Laurent Riou. This proved revelatory for its sparkling interplay of instrumental colours, giving fresh insight into Ravel’s lively writing. Jacobs’s subtly articulated playing, alternately delicate and boldly assertive, matched Price’s joyous trajectory of Ravel’s ever-changing moods - bustling playfulness subsiding into an air of calm, then giving way to carefree skipping and prancing gaiety. Marvellous stuff. Price’s bent for individual programming was further in evidence in the item that followed - The Sapphire by the contemporary British composer David Heath (b 1956). Dedicated to his daughter after whom the piece is named, it superbly evokes the sounds of bagpipes, heard in the distance across the fields as the composer was out walking on the day of his child’s birth. Jacobs’s restrained touch at the piano sparsely suggested the drone of the pipes during the piece’s haunting opening strains, giving way to Price’s exuberant oboe in free fall, indulging in a joyous Scottish dance. Robert Schumann’s Adagio and Allegro, originally scored for French horn and piano, fared well in the transcription we heard for oboe and piano, the players astutely highlighting the work’s strong affinity with a Romantic bel canto opera aria and cabaletta. After intermission we were treated to further rarities. A lusciously full-blown account of Eugène Bozza’s Fantaisie Pastorale offered Price a platform to display her bravura skills in a dazzlingly climactic cadenza. Henri Dutilleaux’s Sonata for Oboe and Piano offered further atmospheric mood-setting, the composer’s sharply-etched writing conveying an idiosyncratic flow of ideas in this early piece from his oeuvre. By way of a palate cleanser, the starkly scored Pieskarieni for solo oboe, written by Pēteris Vasks (b 1946), eerily realised the composer’s intention of evoking the dark forces of nature in conflict with humanity (as introduced by Price before her remarkable performance of the piece). The programme ended with an all-stops-out account, spectacularly delivered by Price in full flight, of the Themes and Variations from Donizetti’s Opera, La Favorita by Antonio Pasculli (1844 -1924).